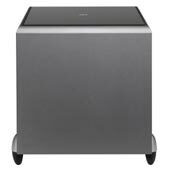 A discreet minimalist cube housing a high efficiency 250 Watt amp driving a 210mm (8") down-firing woofer, PSW 2000 packs the extended bass punch you need to feel the full impact of movie special effects. From the gold plated terminals to the bevel-edged glass top, the detailing is immaculate - and when you listen, that's exactly how it sounds. A very good product , never had problems with it . There are some people around saying that the internal amplifier died after 2 years... GENTLEMEN, if you keep any electronic device 24 h / day under working stress ( being pluged to 220 V ) , it's quite normal for the lifetime to be DRASTICALY reduced... Keep your TV to work 24 h every day and he won't reach 2 years... I have the Kef PSW2000 sub for more than 12 years and he works like day 1 since I bought it new but when I finished listening music or watched a movie or 2 or 3 ,etc , I switched the OFF button . It's normal. Even us , "intelligent" people can't work 24 h / day ... are we ? So , congratulations KEF ! After two years, the amp in the sub died. Replacement parts were almost as expensive as buying a new sub woofer. Doesn't go very low. It's (erronously) tuned to 57 Hz and doesn't go much lower than that. It gives the impression of only playing one note. The amp is a seriously bad design since most of the PSW 2000's seems to have died. I bought a dead one dirt cheap and fixed it myself. Since it's made of thin MDF (14 mm) one has to stabilize the box with cross-braces. I plugged one of the vents, and now it's tuned to 47 Hz. That's more like it. Now it can play more than one note.